November 1958 - Oh Boy! Tommy rocks up a storm with the Dallas Boys during the live broadcast. Tommy Steele makes his one and only guest appearance in the entire “Oh Boy!” series. Above is a rare picture of Tommy on the “Oh Boy!” set flanked by the Dallas Boys, the Vernons Girls and Lord Rockingham XI featured in the “Disc” music paper published later that week. Tommy chats to Jack Good backstage. Tommy Steele rehearses with Neville Taylor and Cliff Richard. The organ featured is Cherry Wainer’s. 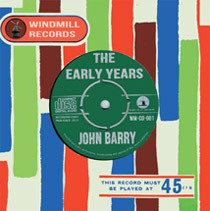 Three members of The John Barry Seven, guitarist Ken Richards, tenor saxophonist Mike Cox and drummer Ken Golder, made their last appearance with the band on this episode. A callboy, Jeremy Hoare, was permitted by Jack Good to film the rehearsals and he has uploaded his material onto Youtube. As producer Jack Good was this week booking Cliff Richard and Don Lang to star in his ABC-TV show "Oh Boy!" until next March, rumours were spreading that it is soon to be extended in a novel form. From early next month the programme may become a 60-minute production split into two parts - the present show at 6 p.m. and another at the end of the evening. The late show would not be a repeat, but a separate production. ABC-TV managing director Howard Thomas told the NME: "We have not decided to go ahead with this idea yet. We think "Oh Boy!" is a great success and are considering if it should be extended in some way." The programme was originally booked until December 6 but a fortnight ago it was extended for at least another three months. Good plans to feature Cliff Richard on the show weekly until the end of the year and then at three-weekly intervals. Also from January, Don Lang will be seen every three weeks on "Oh Boy!" He has already guested twice on the series. Lord Rockingham's XI, The Vernons Girls and The Dallas Boys will continue as regulars into the New Year. Later bookings include Pat Laurence (November 15), a return by Lorrie Mann (22nd), and newcomers Emil and George Ford (29th). The John Barry Seven included three new members in this appearance: drummer Dougie Wright, tenor saxophonist Dennis King and guitarist Vic Flick. The band played their latest record, Farrago. A complete telerecording of this show was recently discovered. Cliff makes his variety debut at the Metropolitan, Edgware road, London. This was a gruelling three-week tour (42 shows) arranged by his manager Franklyn Boyd and intended to give the young Cliff an intensive crash course in the art of stagecraft. The NME write up on the following Friday (21st) gives an interesting and not oft given detailed account of the songs in Cliff’s early act. Many of the songs here were undoubtedly featured on “Oh Boy!” too during the last quarter of 1958. Both “Move It” and “Don’t Bug Me Baby” were favourites performed on the opening show of the series, and “High Class Baby” (his 2nd single) was performed on “Oh Boy!” around late November as well. The Conway Twitty hit “It's Only Make Believe” was another number Cliff loved performing live with a wonderful look of ‘anguished pain’ on his face and grabbing his arm as if jabbed by a hypodermic syringe. It is probable that Cliff sang this track on “Oh Boy!” too. In fact when Conway Twitty himself visited Britain to appear on 2 shows in May 1959 he closed one of the shows with this number. Cliff Richard isn't going to forget this week in a hurry. When he woke up on Sunday morning this is what faced him: a concert at the huge Trocadero Cinema, Elephant and Castle, London; two days in the film studio for "Serious Charge"; a Wednesday afternoon recording session at Columbia; a Jack Jackson Show" the same evening; two days rehearsal for, and the actual transmission of "Oh Boy!" Dominating all this was his first week in variety - almost a full-time job in itself. Eighteen-year-old Cliff never flinched. In between houses at the Metropolitan Theatre, London, on Monday, Franklyn Boyd, his manager, suggested the friends that had gathered in his dressing room should leave to let the singer rest. "No don't go," Cliff said, "I'm not tired." Neither was his later performance a tired one. Richard slogged hard all through his act, swinging his pelvis in the widest arcs yet seen in Britain, vocally forcing his numbers over and compelling the female part of the audience, at least, into an ever increasing frenzy. In the Drifters, Cliff has the best group yet to tour with a rock singer. It has an enormous power and compelling beat, yet was never too loud to drown out Cliff's singing. As the "Move It" boy was announced, it thundered out from behind the curtain. The excitement had already started. "Baby, I Don't Care" was his first number. Scarcely a pause and straight into "Summertime Blues," "I've Got A Feelin," and "Don't Bug Me Baby." Wisely he cut his talking to the minimum. He introduced the members of the group: Hank B. Marvin, Bruce Wells (guitars), Jet Harris (bass) and Terry Smart (drums). Then the smouldering Cliff went into "King Creole," a slow, struggling "Only Make Believe" and a nonchalant, hand-in-pocket "Poor Little Fool," before coming to his record hits "Move It" and "High Class Baby." Came his finale and he set out to include and exceed everything that had gone before with "Whole Lotta Shaking." Fast, slow; loud, soft; wild, quiet; shaking or kneeling - Richard scored a notable triumph. DON WEDGE. Harry Robinson, musical director of “Oh Boy” marries model Ziki Arnot. The couple take a short honeymoon in Paris until Friday 21st November. Cy Payne deputizes at rehearsals for four days. Bertice Reading, a star of the two trial “Oh Boy!” shows in June 1958, falls ill and cancels her cabaret commitments in Britain. LARRY PARNES announced this week that, despite requests from the singer, he would not release Big Beat star Marty Wilde from his current contract. He told the NME: "I intend to go ahead with my plans for Marty. At present they involve a film and a Scandinavian tour next year." COLUMBIA'S Michael Holliday is the latest big name attraction booked by producer Jack Good for his ABC-TV Saturday evening "Oh Boy!" show. Mike is set to appear on December 6, while the following Saturday (13th), marks the debut of Parlophone's Glen Mason. Bill Forbes, discovered by Jack Good at an audition, has been signed by Columbia records. He makes another appearance on December 13. One week later, American rock singer, Vince Taylor, undertakes the first of several guest spots. Fontana's new artist, Carmita, is booked for the same date. (20th). The King Brothers appear on December 27th, replacing the Dallas Boys, who will be appearing on "6.5 Special" on that date. Resident singer Peter Elliott has been booked for a further seven appearances, plus an option of six more, making a total of 13. Comperes Tony Hall and Jimmy Henney have also been booked until March. It is likely that the show will shortly be increased in length, rather than presented as a two-part production. A gala December 27 production may launch the first of these longer shows. Jack Good is confident of the show being extended still further, probably until June. Midland viewers may have an opportunity of attending a performance of "Oh Boy!" in December. It is planned to run a special train from Birmingham to London one week-end next month so that fans in the area may form the audience in the studio. Talks have progressed this week for the TV show to be presented on stage. The full TV cast are likely attractions, but television rehearsal rquirements will probably restrict the show to the London area. EMI's LP record featuring most of the "Oh Boy!" company is scheduled for release on Dec. 5. Harry Robinson, musical director of the series, was married on Monday to model Ziki Arnot. He returns from a brief Paris honeymoon today (Friday). Meanwhile, Cy Payne has deputised for him at rehearsals. For the second week in succession, Cliff Richard was mobbed by fans when he left the Granada, Walthamstow, last Sunday. Once again Cliff was whisked off in a police car whilst fans invaded the stage door. A number were injured. At the end of the first house a number of teenage girls climbed on to the stage and jived with the stars. After half-an-hour's frantic rock 'n roll with The Drifters, Cliff appeared on stage for the finale with the rest of the cast, including Wee Willie Harris, Larry Page and the Bachelors. Over 500 teenagers screamed their approval and rose from their seats and surged forward and crushed against the apron stage. Between shows, a girl fell from a ladder while attempting to enter a first floor dressing room through the window to get autographs. In the rush to the stage door after the second house, a number of teenagers were injured. One girl was taken to hospital by ambulance with a suspected fractured ankle. She was not detained. Police were called when youths began to throw newspaper placards on to the heads of the crowd from a nearby wall. Theatre manager Ralph Papworth told NME: "I've had Johnnie Ray here - but it was never like this. I've never seen anything like it, they just went wild." COLIN HICKS, Nixa's teenage beat singer, is the latest recruit to the ranks of ABC_TV's Saturday evening "Oh Boy!" show. He makes his debut on December 27 - the date originally planned for a special Christmas edition, but which will now retain its usual format. The following week, January 3, marks the return of Terry Dene. This will be his second appearance - he was previously seen last month, when he deputised at short notice for Cliff Richard. SUCH was the impact of new British singer Mike Preston in America that his return, already delayed a week, was postponed a further three days by additional radio and television appearances. Mike came home on Wednesday. Despite his initial success as a singer Mike is continuing with his job as a cameraman for a firm of commercial television cartoonists. Only one of three 1958 broadcasts in which Cliff Richard did not appear. The others being Show No. 3 from 27th September & 18th October 1958 when there was a mix up over dates.